MHS hosts El Dia de los Muertos presentation. For the last several years, Messalonskee Spanish teachers Eunice Loredo and Karalynn Gibson have brought their classes to the University of Maine for their annual El Día de los Muertos presentation at the Hudson Museum. This year, they decided to host the presentation at MHS for the first time. On Friday, November 2nd, Spanish students from Waterville, Lawrence and Medomak Valley High schools came to Messalonskee for a one-hour presentation on the celebration of El Dia de los Muertos, or the Day of the Dead. The presentation, led by Senora Loredo, was done in English and addressed the World Language standard of connections with history, cultures, and comparison. Senora Loredo told stories of her personal experience with the celebration growing up in Mexico. Students in attendance got to see a traditional El Dia de los Muertos display and taste foods connected with the celebration. Each Spanish 3 student played a role in designing and building the Dia de los Muertos altar. 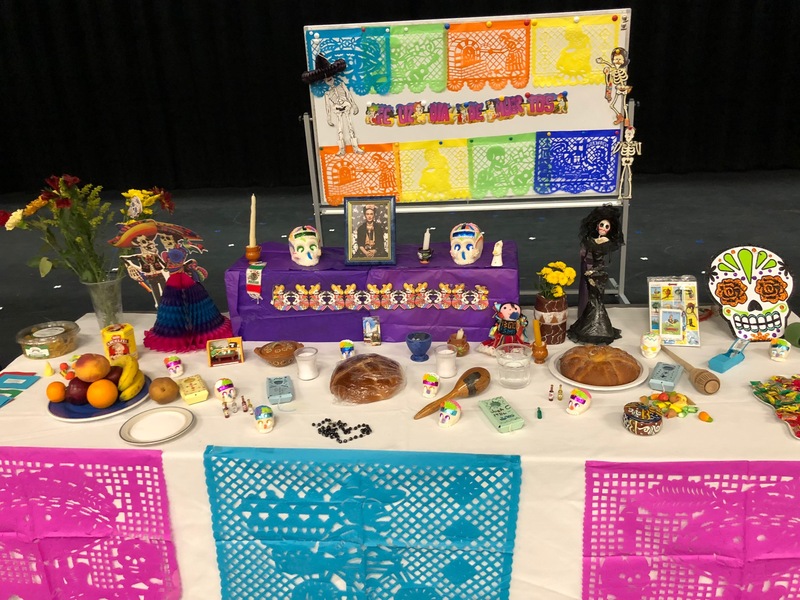 The traditional altar decorations included sugar skulls, paper flowers, marigolds, candles, and traditional foods, all brought in or made by the class. Each student also chose a person to honor, whether it was a family or community member, or a famous Hispanic person. Next BCS takes on Principal’s Reading Challenge.